The state of Sabah is blessed with many wondrous attractions and generally easily reached on rather good paved roads .Mesilau situated on the slopes of Mount Kinabalu is no exception . Mesilau is a small village situated on a ridge on the slopes of Mountain Kinabalu and is about 100kilometers from Kota Kinabalu . Mesilau, named after the Mesilau River, is an area situated at approximately 2000 m above sea level on the East Ridge of Mount Kinabalu in the Kinabalu National Park. To get to it , one first goes to the farming town of Kundasang between Kinabalu park and the town of Ranau.Drive straight through the town of Kundasang and head for the mountain . Places of interest here are the Desa Diary farm, an 18 hole golf course (which is the highest golf course in Sabah ) the Mesilau Nature resort which is sadly now closed due to logistical issues after the last Earth quake and various home stays and small resorts. It has a delightful climate which is cool and windy being at such a high elevation and next to Mount Kinabalu . Currently on of the most visited attractions at Mesilau has to be the Dairy farm. 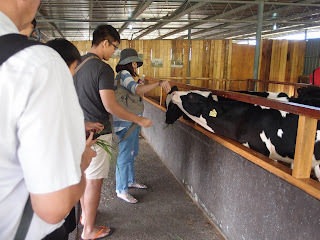 Many local and foreign visitors make a point of visiting the farm for it cool weather and scenic views. 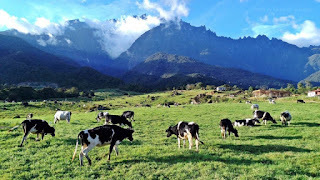 Fields of green grass with black & white Frisians grazing cows amidst rolling valleys and hills with a backdrop of majestic Mount Kinabalu if the weather permits , otherwise it will be pillowly clouds , remind many people of similar scenic views in New Zealand . it has also became the haunt of many local newly weds for photo shoots. The farm has undergone tremendous renovations since its inception for the betterment of the cows and visitors . There is a glassed viewing gallery for visitors to observe the daily milking of the cows. A couple of pens to which visitors are allowed to get up close to some calf and goats . You may also feed them with grass or milk for a small fee . It is a great bonding opportunity for families with young children. The farm also produces its own Gelato which is delicious and creamy , fresh flavored milk together with about 4 varieties of cheese. All these items, together with a gift shop selling memorabilia of the Cows are available for visitors to purchase . Definitely an interesting option to do on a day out of the city.